A three-phase, coin box routine with no difficult sleights. Perfect for the magician who doesn't do coin magic but wants to add an astounding effect to the repertoire. Can be performed close-up and surrounded. Included is Bob's "Beat the Devil" bizarre patter story. You will need one Boston Coin Box and two Okito Coin Boxes to perform this routine. M.D. "A blast to play with ... I have been having so much fun ...."
R.R. "... (The routine is) a classic, down to professional quality patter." D.S. "A real nice piece of work ... great ideas and routines ... I ... was quite impressed with the in depth instructions. ... am really pleased ...."
J.L. "What a routine! ... (Spectators) ... don't have a snowball's chance in an oven of figuring it out ...."
R.D. "Way cool ... Diabolically clever ... The routining is brilliant ... dead easy to execute ... virtually no sleights ... The boxes do the work for you ... I love it." D.H. "The routine ... is worth the money." 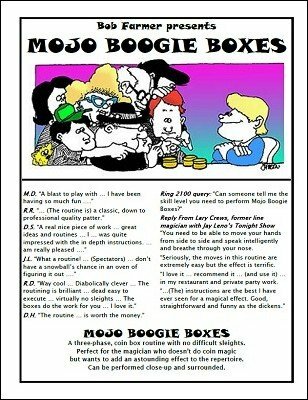 Ring 2100 query: "Can someone tell me the skill level you need to perform Mojo Boogie Boxes?" Reply From Lary Crews, former line magician with Jay Leno's Tonight Show: "You need to be able to move your hands from side to side and speak intelligently and breathe through your nose. Seriously, the moves in this routine are extremely easy but the effect is terrific. I love it ... recommend it ... (and use it) ... in my restaurant and private party work. ...(The) instructions are the best I have ever seen for a magical effect. Good, straightforward and funny as the dickens." 1st edition 1999, updated 2018, 20 pages.